Bambi originally came from a sweet, loving human family, which she had protected as much as she could. She had found them when she was a pup. Of course, being a large pup had its...challenges. Bambi was a huge chewer, and tended to tear up the family's furniture. There was once, Bambi thought she was being friendly and even injured a guest. Once she reached the age of one, she was forced out on her own. She was left out on the side of the road. 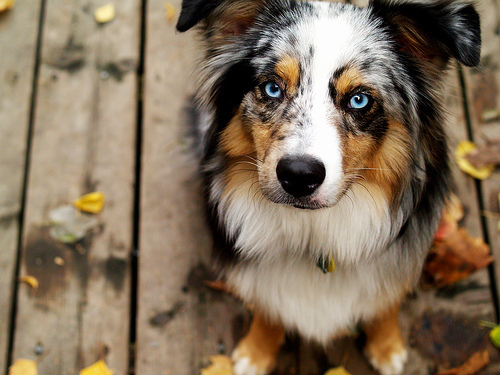 Being a house pet pretty much all of her life, the young Australian Shepherd didn't know the in's and out's of being on her own. Eventually she stumbled into a Red Husky, who had showed her the ropes. A few months in, her companion was shot down by a human. Bambi, being the coward she was, had run off to save her own tail. Around the age of two she had found out about the packs which leads her to today. Bambi is an extremely small dog, even for her breed. Though she appears small, she can appear threatening and even frightening at first, or when need be. Despite this, however, she can prove to be extremely loyal and respectable. She does tend to have an attitude to her, snapping at anything that truly bugs her. Bambi is a bit sarcastic, always coming up with a quick remark in no time at all. If her mind is set for something, she won't back down, and may even fight you for her right. Bambi is also a very flirtatious canine. Size: Most Aussie's stand at 18-21 inches, however, Bambie is around 10-15 inches. Weight: Most Australian Shepherd females weigh in about 30-40lbs, however, being smaller than the average Aussie, causes her to be at around 20-25lbs. Siblings: She hardly remembers her siblings, much less their names. She remembers having 5 other siblings.